I had a feeling this was going to happen sooner or later. Some enterprising modder has modeled Beck, Mighty No. 9's protagonist, from scratch and added him to the Super Smash Bros. Brawl roster. The model has been applied to the bone-skeleton of Mario. The characters being roughly the same size, it all works out quite nicely. Those interested can download Beck from the Brawl Vault forums here. For more images, hit up Infinite Smash Team. Once that's done, you can try your hand at pitting Beck against a modded Mega Man. Oh, what fun! Perhaps someday, when we see a little more of Mighty No. 9's world, these folks can whip up a stage or two. The Smash mod community clearly has the motivation already. It was only a matter of time! Very nice model too. just wait until the game comes out and theres a real model! Wow. o_o Some people are really ambitious! Kudos to the person or people responsible for this! Are fans really this desperate to play as a character that still hasn't left Kickstarter production yet? First came the fan art, then some fan games with Beck came up. Now they're replacing models of characters from existing games? My word, I say give the kickstarter some time. Though I have no offense to this at all. I'm just saying people just seem to be too quick to come out with this stuff before the official game can even begin actual production. Um, you do realize the game passed its funding goal of 900K. It begins development, like, next week when the campaign ends. Its happening. No game before April 2015...and im sure, it will be a game who wont be longer than mmX8 (8 robot, same thing, maybe longer than a mm7). You do realize You are like a fanboy who are too much exited with 3 screens and 1 song? and NO GAME BEFORE 2015 ok. I prefer wait for a true megaman game. But people are so no-patient....they become crazy with Mighty 9..... just to finish a game and to say "yeah im pro AGAIN"
Capcom need certainly a new team to create megaman games. This screen is ridiculous anyways. 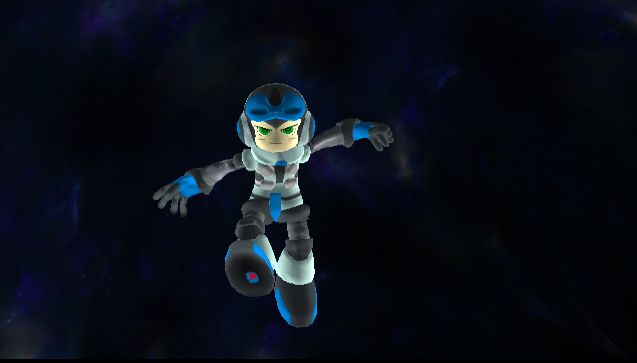 What a shame for megaman who is in ssb4. MM is dead, Capcom will fall VERY SOON, and if we want MM to live at all in any capacity than we must put all our support behind Mighty 9. Dude, it was just something some Brawl fans did for fun. JESUS CHRIST.